Washington, D.C. — Over the spring, I was approached to participate as a donor to the Haycock Elementary School's annual auction fundraiser. It was a good opportunity to promote Handmade Letters' services to a wider community in Falls Church, Virginia, but more importantly, to contribute my time for a good cause. 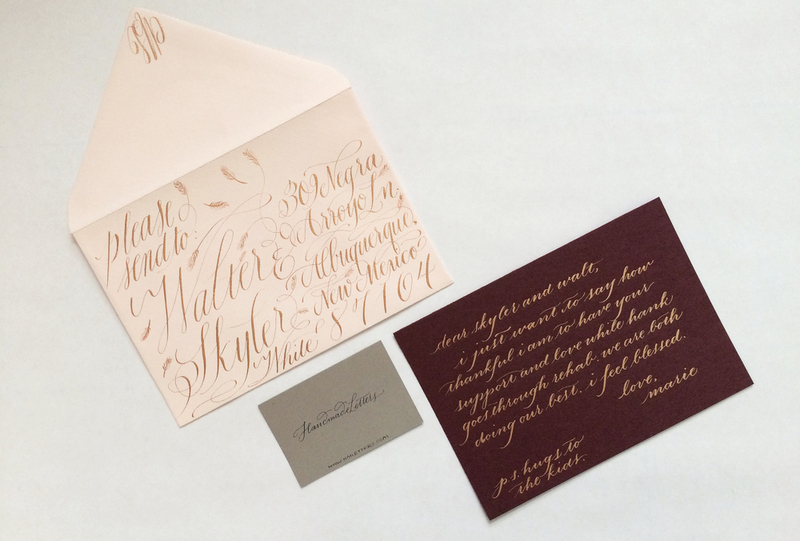 The auction item included a service package of five letters to be calligraphed on behalf of the auction winner. With the help of my infallible sister Maria Reyes, three color sets were chosen for the winner to select. The classic, pastel, and vibrant letter sets, deftly chosen by my sister Maria Reyes. Along with the envelope and letter sets, I made two sample letters for display at the auction event. 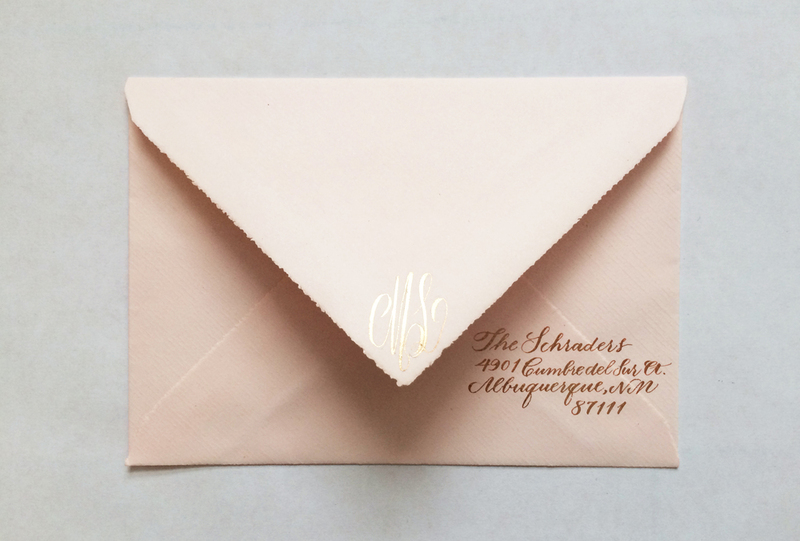 I wanted bidders to have a sense of how striking calligraphy can be in person and to understand how sending handmade letters can really make an impression. A simple, handwritten note of congratulations is much more special than an e-mail or text can ever be. The thought and effort behind it are easy to see. Sample letter #2: Thank you! Sample letter #2: From the desk of Marie Schrader. As a fan of Breaking Bad, I thought it would be fun to include an inside joke for the auction participants. This sample is an imaginary note of thanks from Marie Schrader to Walter and Skyler White for their "support" during her husband Hank's recovery. Participants who were fans of the show would be able to discern the bit of dramatic irony (and Marie's usual obliviousness) in the letter's message. N.B. The addresses on the Breaking Bad letters are the actual, fictionalized homes of the characters. It was a wonderful opportunity for me to participate in this auction fundraiser, and my thanks go to Kristen Chandler and the school's auction panel for making the process very easy. I look forward to calligraphing letters for the winner.